Menu item calendar/clock with iCal integration. Is there a better alternative to MenuCalendarClock iCal? Is MenuCalendarClock iCal really the best app in Personal Info Managers category? Will MenuCalendarClock iCal work good on macOS 10.13.4? 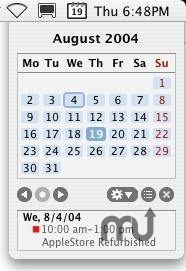 MenuCalendarClock iCal gives you instant access to your iCal calendars from a menu bar icon. A monthy calendar view with your iCal schedule is just a click away. A configurable clock is included as a free add-on. Full task management is included! Most features are free to use, some require a registration. See company Web site for details. Fixed: 12h-time users were seeing 24h "military" time in schedule. Release versions are available in English, German, Finnish, French, Italian, Dutch, Spanish, Catalan, Russian, Norwegian, Japanese, Simplified Chinese and more. The basic features can be used freely without strings attached, the advances features require a registration.